As the Northwest summer shines on, production continues in Eastern Washington on Syfy series Z Nation. The zombie-centric show is being shot in and around Spokane, and three Washington-based actors have been cast as series regulars. Nat Zang, represented by Big Fish NW Talent, plays 10K, a young survivalist with a tragic past. 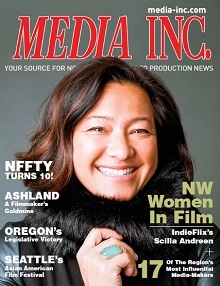 Because of its production location and status as a Washington film incentive project, Z Nation has provided unusual access to Washington’s pool of actors to work on a network series. This is Zang’s first on-camera acting experience. Becky Reilly with Big Fish NW Talent is one of the talent agents who was on the frontlines during the Z Nation casting process. “Throughout this process, Big Fish has had first contact with more than 2,400 Spokane-area locals just aching to be zombie extras,” she says. Through just the first two weeks of production, they had billed for 320 man-days for extras alone. The local talent agencies and actors aren’t the only ones who benefit from the Spokane production. The economic impact is felt by related businesses, as well. In addition to providing unique work opportunities for the actors, the Eastern Washington production is also a welcome shooting environment. George Riddell is Executive Editor of Media Inc magazine and media-inc.com. He is President-Producer/Director at BigHouse Production LLC. In addition, he serves on the board of directors of the American Advertising Federation in Washington DC and is the national chairman of the American Advertising Awards committee.